The Binweevils Pirate week is coming up once again and starts Wednesday September 16th. This is a great place to party and hang out with other Weevils that are celebrating Pirates. 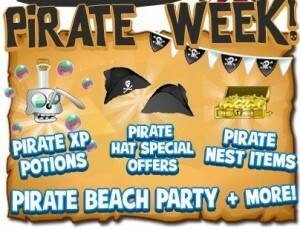 Throughout this week there will be new Pirate Nest Items, Pirate Xp Postions, special hat offers for plus a new Pirate Beach Party. There is also a rumor going around that there will be a lot more other fun stuff as well so you don’t want to miss the Pirate week on Binweevils. Next week is packed with a bunch of fun stuff so make sure to login to your account and check it out.